The impressive ruins of Rievaulx Abbey are the perfect choice if you want a day out immersed in history. I found the peaceful atmosphere and beautiful surroundings the perfect stimulus for an imagined trip back in time. 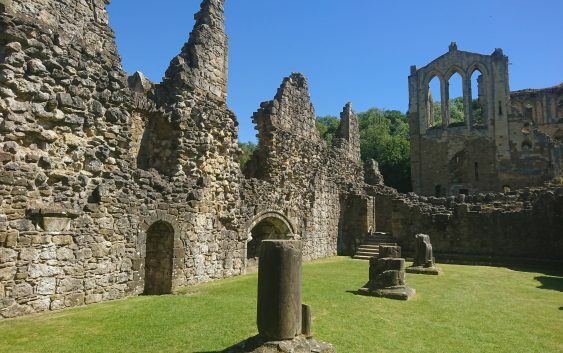 The extensive site is home to some of the most complete of England’s abbey ruins. Walking around it’s easy to imagine what the Abbey must have looked like hundreds of years ago. The ruins include extensive remains of the church, which was one of the finest in the North, claustral buildings and five arches from the original cloister. As well as the ruins, there is an indoor museum which houses archaeological finds from around the site. The museum tells the story of the rise and fall of the Cistercian abbey. As you walk around the site you’ll find plenty of seats and picnic tables. Also, there is also a small shop and a tea room selling generous portions of soup, sandwiches and cakes as well as a range of hot and cold drinks. Plus the cafe has lots of seating both inside and outside, overlooking the ruins. The remote location and setting make it a very atmospheric place. The site is large enough to accomodate a lot of people. However, it never feels crowded or busy, with plenty of quiet corners. It’s OK to take your dog as long as it’s on a lead (even in the cafe area). Rievaulx Abbey is located in Ryedale on an area which overlooks the River Rye. The ruins are overlooked by an elegant terrace of lawns, complete with Grecian temples. These were built in 1758 (Rievaulx Terrace). Finally, framing the Terrace and Abbey is a huge area of wooded hillside. Rievaulx Abbey, Near Helmsley, North Yorkshire. Rievaulx Abbey is easy to find, on a minor road, half a mile west of the B1257, two and a half miles north-west of Helmsley (Post Code: YO62 5LB). Alternatively, drive to Rievaulx after visiting the charming hamlet of Old Byland, two and a half miles away. If you are driving to Rievaulx, the car park gets very busy on weekends and sunny days, so be sure to arrive early. If you want to add a walk to your day out, it’s possible to walk to the Abbey from Helmsley. Follow in the footsteps of Saint Aelred, one of the county’s most famous abbots, and take the easy to follow walk from the medieval fortress of Helmsley Castle. Walk from Helmsley to Rievaulx Abbey. The walk from Helmsley to Rievaulx follows the first part of the Cleveland Way National Trail. Signposts are easy to spot and marked with an acorn. Extend the walk into a seven-mile circular outing, returning to Helmsley via Griff Farm. The route takes in magnificent woodland, the valley of Blackdale Howl and has amazing views from the top of Jinny York Bank. The walk is described in detail on the North Yorkshire Moors website, www.northyorkmoors.org.uk. Founded in 1132, Rievaulx Abbey (Pronounced ree-VOH) was a Cistercian abbey in Rievaulx, in the North Yorkshire Moors National Park. The grounds provided fertile farmland and a site for smelting iron. The hard work of the monks transformed the Abbey into a busy hub of commerce and industry. It was one of England’s greatest abbeys until Henry VIII seized it in 1538 during the dissolution of the monasteries. Rievaulx Abbey, near Helmsley, North Yorkshire. Seen from Rievaulx Terraces. The Abbey is cared for by English Heritage. If you have an English Heritage card you can enter the Abbey for free, or pay the small entrance fee.